Caleb Martin Joseph (born June 18, 1986) is an American professional baseball catcher for the Arizona Diamondbacks of Major League Baseball (MLB). 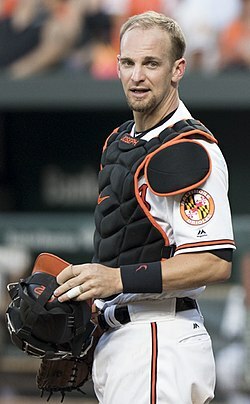 He has previously played for the Baltimore Orioles. Joseph attended Franklin High School in Franklin, Tennessee, where he played for the high school baseball team. He attended Lipscomb University, choosing to play college baseball for the Lipscomb Bisons in the Atlantic Sun Conference, due to the promise of more playing time than he was offered by Vanderbilt University and the University of Arkansas, where he was also recruited. In his junior year, Joseph led the Bisons with a .342 batting average, 17 home runs, and a .615 slugging percentage. He was named to the All-Conference team and was named the Most Valuable Player of the conference tournament. The Baltimore Orioles drafted Joseph in the seventh round, with the 206th overall selection, of the 2008 Major League Baseball draft. He signed with the Orioles, receiving a $125,000 signing bonus and tuition payments for his final three semesters of college. In his first professional season, the Orioles assigned him to the Aberdeen IronBirds of the Class A-Short Season New York–Penn League, where he batted .261 with eight home runs and 34 runs batted in in 63 games. In 2009, the Orioles assigned Joseph to the Frederick Keys of the Class A-Advanced Carolina League. He played for the Bowie Baysox of the Class AA Eastern League in 2010, and for the Scottsdale Scorpions of the Arizona Fall League after the season. The Orioles returned Joseph to Bowie in 2011 and 2012. In 2013, Joseph had a .299 batting average, 22 home runs, and 97 RBI for the Baysox. He was named an All-Star at mid-season and for the season-ending team, and was named the Eastern League's Minor League Player of the Year by Topps. At the mid-season Eastern League All-Star Game, Joseph won the Home Run Derby. The Orioles did not renew his contract, and he was not selected in the Rule 5 draft in December 2013. In six and a half minor league seasons, he has hit .268. Joseph began the 2014 season with the Norfolk Tides, where he batted .261 with a .284 OBP and .402 slugging percentage in 22 games. He was promoted to the Orioles on May 7, going 0-for-3 in his MLB debut in a 4–3 win over the Tampa Bay Rays at Tropicana Field that night. His first major league hit was a fourth-inning single off Drew Smyly in a 4–1 loss to the Detroit Tigers at Camden Yards six nights later on May 13. He hit his first major league home run off David Huff in the ninth inning of an 8–0 triumph over the New York Yankees at Yankee Stadium on June 22. On August 9, Joseph hit a home run in the Orioles' 10–3 win over the St. Louis Cardinals; making him the first Orioles catcher to homer in 5 consecutive games. He batted .207/.264/.354 in 246 at bats for the 2014 season. With Matt Wieters still recovering from Tommy John surgery, Joseph began the 2015 season as the Orioles starting catcher. Joseph was hitting .243 with 4 HR and 18 RBI in 43 games until Wieters was activated on June 5, and following his activation, Joseph and Wieters split catching duties. In 100 games in 2015, Joseph hit .234/.299/.394 with 11 HR and 49 RBI. Joseph also caught 33% of attempted base stealers, and led the pitching staff to a 3.65 ERA when he was behind the plate. After driving in a pair of runs in a 14–8 home victory over the Kansas City Royals on September 11, 2015, Joseph would not be credited with a run batted in (RBI) in any MLB regular season game until 19 months and 18 days later. The span included the entire 2016 campaign in which he had 132 at-bats and 141 plate appearances, breaking a major-league record which was previously held by Wilbur Wood who had 96 and 124 respectively in 1971. The drought ended when he hit a two-run homer off Tommy Layne in the ninth inning of a 12–4 away loss to the Yankees on April 29, 2017. In February 2017, the Baltimore Orioles beat Joseph in arbitration, and he was given the team's $700,000 offer (an increase from his prior salary of $523,500), instead of his $1 million request. Joseph struggled early in the 2018 season. On May 18, the Orioles optioned Joseph to Norfolk. On February 13, 2019, Joseph agreed to a one-year contract with the Arizona Diamondbacks. Joseph is married with two children. Joseph's brother, Corban, is also a baseball player. Corban was also selected in the 2008 draft, chosen by the New York Yankees in the fourth round. They played together with the Orioles in 2018. Their father, Mark, played college baseball for Lipscomb. ^ a b "IronBirds' Joseph feels right at home — Baltimore Sun". Articles.baltimoresun.com. July 21, 2008. Retrieved September 6, 2012. ^ a b c Strasinger, Mike (June 9, 2008). "Joseph brothers both selected in major league baseball draft". Nashville City Paper. Archived from the original on December 2, 2013. Retrieved September 6, 2012. ^ "Joseph's clutch hit paces Scorpions rally | MLB.com: News". Mlb.mlb.com. June 19, 2012. Retrieved September 6, 2012. ^ Melewski, Steve (November 13, 2010). "Caleb Joseph makes changes with his defense". Masnsports.com. Retrieved September 6, 2012. ^ Miller, Avi (April 3, 2012). "Bowie Baysox Roster Preview". Baltimore Sports Report. Retrieved September 6, 2012. ^ "O's move Joseph up to majors, demote Weeks | Sports — WBAL Home". Wbaltv.com. May 1, 2014. Retrieved May 7, 2014. ^ Seiner, Jake. "Bowie's Joseph wins Home Run Derby | MiLB.com News | The Official Site of Minor League Baseball". Milb.com. Retrieved May 7, 2014. ^ a b "After years of late-night bus rides, Caleb Joseph enjoying chance with Baltimore Orioles". Baltimore Sun. Retrieved January 6, 2015. ^ ""Orioles select contract of Joseph from Norfolk; Weeks optioned to the Tides" (press release), MLB.com, Wednesday, May 7, 2014". M.mlb.com. May 24, 2018. Retrieved June 16, 2018. ^ "Encina, Eduardo A. "Caleb Joseph makes major league debut vs. Rays," ''The Baltimore Sun'', Wednesday, May 7, 2014". Baltimoresun.com. May 16, 2018. Retrieved June 16, 2018. ^ "Baltimore Orioles 4, Tampa Bay Rays 3; Wednesday, May 7, 2014 (N) at Tropicana Field – Retrosheet". Retrosheet.org. May 7, 2014. Retrieved June 16, 2018. ^ "Hass, Trevor. "Big night for rookie catcher Caleb Joseph in Orioles' loss to Tigers," ''The Baltimore Sun'', Tuesday, May 13, 2014". Baltimoresun.com. Retrieved June 16, 2018. ^ "Detroit Tigers 4, Baltimore Orioles 1; Tuesday, May 13, 2014 (N) at Camden Yards – Retrosheet". Retrosheet.org. May 13, 2014. Retrieved June 16, 2018. ^ "Orioles hand Yankees' Tanaka second loss," Reuters, Sunday, June 22, 2014. ^ Townsend, Mark. "Orioles rookie Caleb Joseph has homered in five straight games". YahooSports. Retrieved September 27, 2014. ^ Kubatko, Roch (November 14, 2015). "Caleb Joseph on Matt Wieters taking qualifying offer". MASN. ^ "Schmuck, Peter. "Orioles' Caleb Joseph is suddenly a hit machine after a year of total frustration," ''The Baltimore Sun'', Tuesday, May 9, 2017". Baltimoresun.com. May 16, 2018. Retrieved June 16, 2018. ^ a b AP (February 2, 2017). ""Orioles beat catcher Joseph for 9th straight arbitration win," ''The Associated Press'', Thursday, February 2, 2017". Usatoday.com. Retrieved June 16, 2018. ^ Associated Press (April 30, 2017). ""Gardner busts out, Yanks hit 4 more HRs to rout Orioles 12-4," ''The Associated Press'', Saturday, April 29, 2017". Espn.com. Retrieved June 16, 2018. ^ "Orioles notes: Struggling Caleb Joseph gets a break as long stretch of righties looms". Baltimore Sun. Retrieved September 8, 2018. ^ "Notes: Orioles send Caleb Joseph to Triple-A Norfolk, recall Andrew Susac". Baltimore Sun. Retrieved September 8, 2018. ^ "D-backs agree to 1-year deal with Joseph". MLB.com. MLB. February 13, 2019. Retrieved February 13, 2019. ^ Nalbone, John. "Thunder are expecting big things from Corban Joseph". NJ.com. Retrieved September 6, 2012. ^ Silver, Zachary (May 24, 2018). "Caleb and Corban Joseph together on Orioles". MLB.com. Retrieved September 8, 2018. ^ Wilson, David (May 24, 2018). "Caleb Joseph's family tradition propels him to Majors". MLB.com. Retrieved September 8, 2018. Wikimedia Commons has media related to Caleb Joseph. This page was last edited on 12 April 2019, at 01:54 (UTC).